ISRAEL – Horbat Uza - Researchers from the Israel Antiquities Authority discovered the ceramic stamp, engraved with an image of the Temple Menorah, while excavating at Horbat Uza (shown here), a small rural settlement east of the city Akko in Israel. LA REUNION - Sainte-Suzanne : Les ouvriers sont tombés sur un os... Alors qu’ils sont en train de creuser une tranchée dans le chemin Marancourt (menant à la cascade Niagara), les ouvriers de la société Hydrotech font une découverte qu’ils ne sont pas prêts d’oublier. Alors que le tractopelle fait son oeuvre, l’un des hommes fait signe au conducteur d’arrêter. Il pense être tombé sur des branches, mais en regardant de plus près il reconnait des ossements. L’origine de ces derniers ne restera pas longtemps mystérieuse. Un petit crâne est retrouvé encore scellé dans la terre, environ 1,50 m sous la chaussée. Ce dernier est parti en poussière. On distingue un amoncellement d’ossements éparpillés en longueur. Une quinzaine sont visibles facilement. Les militaires cherchent à comprendre l’origine des ossements. Est-elle "historique" ou criminelle ? La première version prendra rapidement le dessus sur la base de nombreux témoignages convergeant vers la présence ancienne d’un cimetière. Les os retrouvés dateraient d’au moins une centaine d’années. YEMEN - Al-Mahwit - Des corps momifiés ont été découverts dans la province d'Al-Mahwit, dans le nord-ouest du Yémen, lors de recherches archéologiques ayant permis de mettre à jour 200 tombes rupestres dans les montagnes de la région, a rapporté lundi l'agence de presse officielle yéménite Saba. "Une récente prospection dans les zones antiques d'Al-Mahwit a conduit à la découverte de 200 sépultures creusées dans la roche, à l'intérieur desquelles des momies ont été retrouvées", a fait savoir Mohammed Gassem, Directeur des Antiquités d'al-Mahwit, cité par Saba. Ces tombes, creusées dans les parois de grès en haut des montagnes, ont été découvertes dans les zones archéologiques de Shibam Kawkaban, d'Al-Rujom, de Milhan, de Hufash, de Bani Saad, et d'Al-Tawila. M. Gassem a ajouté que les archéologues avaient aussi découvert dans les niches funéraires de ces tombes rupestres plus d'un millier d'objets antiques datant d'environ 300 avant J.C.
INDE – Itkhori - Officials of Archaeological Survey of India (ASI), Ranchi circle, today excavated a stone shivlingand a large number of clay utensils near a stupa at Ma Bhadrakali temple, Itkhori, confirming religious confluence and hinting at a well-developed civilisation that flourished around 9th century AD. The excavation started under the supervision of N.G. Nikoshey, archaeological superintendent with the ASI’s Ranchi circle. “Today, we recovered a partially damaged 11-inch black stone shivling and several clay utensils of daily use. This is just the beginning. We have tremendous hopes for the area,” Nikoshey said. The archaeologist added that the discovery of the clay utensils showed the promise of Itkhori being a thriving civilisation in the Middle Ages. 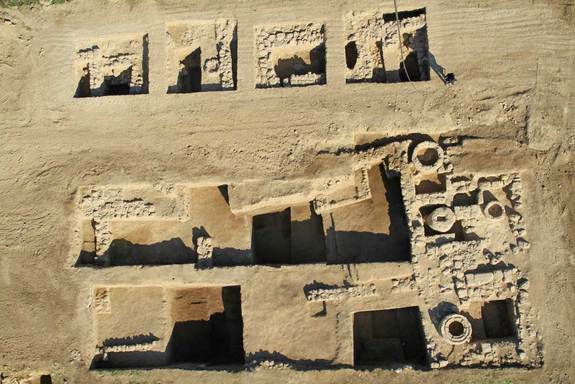 “This excavation will bring the hidden history to all. It is a very important religious centre. We will start scientific excavation after four days,” he said. Local historians have long held that Gautam Buddha had visited Itkhori, but so far no relic has been recovered to prove this assumption. 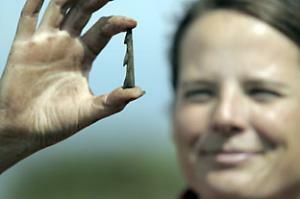 “If this gets proven during the course of this excavation, the area will get international attention. Itkhori will get tourists from across the world. It is only a matter of days,” said Nikoshey. Right now, the area is abuzz with residents who were seen pointing at hillocks near the temple, claiming they would yield historical structures. Vinoba Bhave University history professor Iftikhar Alam also recounted an interesting story on how the place Itkhori got its name. “When Gautam Buddha had visited Itkhori, his mausi (aunt) Prajawati had followed him here to persuade him to give up his plan of going to the forest. But Buddha, sitting under a tree with his eyes closed, didn’t hear her. In sadness, Prajawati had murmured ‘ithal khoi’, which in Nepali means ‘I lost him here’. In Pali language, this phrase became ‘iti khoi’, and gradually, the place became known as Itkhori,” said the professor. Meanwhile, work is also going in full swing to beautify the main temple housing the Ma Bhadrakali idol with marble and red granite. Temple committee sources said the cost of beautification was around Rs 20 lakh. The Itkhori temple, situated 63km from Hazaribagh, witnesses 2,000 devotees everyday at present. It is seen as a meeting place of Hindu, Buddhist and Jain faiths. ROYAUME UNI - Star Carr - A team of archaeologists from the universities of York and Manchester helped unearth the house at Star Carr, a Stone Age site, near Scarborough, in 2010. The wooden house, which is 3.5 metres wide, predates the house previously thought to be Britain's oldest house in Howick, Northumberland, by at least 500 years. The Star Carr structure dates back to 9,000 BC when hunter-gatherers lived in Britain and the research team unearthed the circular building next to an ancient lake at the site. Now the team of archaeologists from theUniversity of York have won a £1.23million grant from the European Research Council to carry out more analysis of the house. The grant will help fund three years of fieldwork involving 20 specialists followed by two years of research analysis. In particular, the team will analyse human responses to environmental change between 10,000 and 8,000 BC at Star Carr. Dr Nicky Milner, a senior lecturer in archaeology at the University of York, believes the research will help develop an understanding of hunter-gatherers during the period. She said: “The hunter-gatherers who lived during this post-glacial period have been characterised as highly mobile, dispersed and living in small groups, and there is much debate as to how they adapted to global warming. Recent discoveries at the Early Mesolithic site of Star Carr, which lies on the shore of palaeo-Lake Flixton, offer a new picture; one in which hunter-gatherers move into a new territory but then settle down and invest time and effort into building huts and large scale wooden structures with evidence for occupation that spans hundreds of years” Dr Milner said it was a necessity to find out about previous lives. She said: “We know little about the lives of our ancestors who lived during the Preboreal – the postglacial period followed rapid climate change about 9600 BC – the last major global warming event on earth.” Star Carr has been listed as a Scheduled Ancient Monument by English Heritage. ROYAUME UNI – Manchester - It survived two world wars, a fire and mining subsidence, but met its match when it was demolished by a scrap metal merchant from Wigan. But now Worsley New Hall is going to be brought back to life by a University of Salford researcher. The Hall has an extremely rich history despite only lasting from 1846 to 1949. 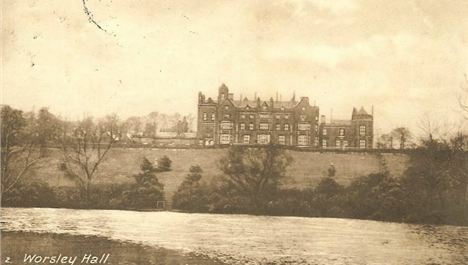 It was used as an officers’ hospital in the First World War and again in the Second World War when it housed Dunkirk evacuees, American soldiers preparing for D-Day, and the Lancashire Fusiliers. In 1943 it was also very badly damaged by fire, riddled with dry rot and structural problems associated with mining subsidence. It was finally bought by a Mr Littler – a scrap metal merchant from Ashton-in-Makerfield who demolished it. It was visited by a number of high-profile royals, including Queen Victoria in 1851 and 1857, the Prince and Princess of Wales came in 1869, and again as King Edward VII and Queen Alexandra in 1909. The Crown Prince of Germany and Empress Eugenie were also guests. The Peel Group has commissioned the University to carry out the research and to make it widely accessible using an online archive. The site will also record the results of archaeological digs which are being conducted by The Centre for Applied Archaeology at the University. INDE – Tirumala - Archaeology department's expert committee that went into the issue of offerings made by Sri Krishnadevaraya to Lord Sri Venkateswara at Tirumala has concluded that the present jewellery in the custody of Tirumala Tirupati Devasthanams (TTD) did not match those reportedly donated by the Vijayanagara Emperor. As per the inscriptions, Sri Krishnadevaraya, a staunch devotee of Lord Sri Venkateswara, had visited the shrine seven times during his lifetime and made a range of precious offerings to the Lord during his every visit. As per the inventory prepared by the expert committee based on the inscriptions, the Emperor had presented one Ratna Kireetam, studded with precious stones such as garnets (2822), emeralds (160), diamonds (423), rubies (3), sapphires (10), cat eyes (1), agate (1) and pearls (1,339) during his first visit on 10-2-1513. In all, its total weight is recorded at 3,308 tunkhas (each tunkha is equal to 2.5 grams). 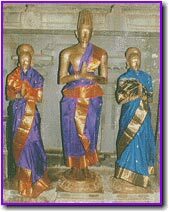 On his second visit on 2-5-1513, he presented ‘vidudhara' (a gold ornament), three pairs of bhujakeerthis, three swords with sheaths, two sheaths with tassels, a pendent, two pairs of addigalapeta with a gold chain and a kireetam (crown). During the third visit on 13-6-1513, he offered to the Lord nine kinds of precious stones. Sri Krishnadevaraya performed a ‘Kanakabhishekam' for the Lord with 30,000 gold coins (varahalu) during his fourth visit on 6-7-1514. One ‘thrisaram' (three-stringed ornament), a pair of kadiyams were donated along with the gold coins during the visit. A copper statue of Sri Krishnadevaraya along with his consorts Tirumala Devi and Chinnadevi paying obeisance to the Lord was presented during his sixth visit on 16-10-1518. A ‘peetambaram' studded with nine kinds of precious stones, was donated on his last visit on 17-2-1521. The description of each antique with the kind of metal and the stones used for its making and its weight was mentioned in the report.